File image of Fremont police car. 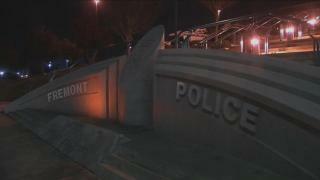 Alcohol may have been a factor in a fatal hit-and-run crash in Fremont late Sunday, according to police. Officers responded about 6:15 p.m. to the scene of a two-vehicle crash between a minivan and a Honda Civic on Central Avenue, just east of Blacow Road, police said. The driver of the minivan fled the scene on foot but was tracked down and taken into custody, police said. A passenger in the Civic died at the scene. Alcohol was being investigated as a possible factor in the crash, police said. Central Avenue between Blacow and Southwood Drive would be closed to traffic for hours into Sunday night during the investigation, police said.